Colts Neck High School of Monmouth County edged out Mainland Regional High School of Atlantic County for the state championship title in the 37th Annual Vincent J. Apruzzese High School Mock Trial Competition sponsored by the New Jersey State Bar Foundation at the New Jersey Law Center in New Brunswick on April 11. 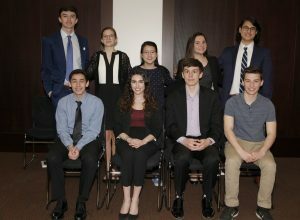 Colts Neck High School will represent New Jersey in the National High School Mock Trial Championship in Athens, Georgia, May 16 – 18. The team was coached by teacher Holly Lucarelli and attorney William Visone, who was a past member of the Colts Neck High School team. Student team members include Nicholas Fischer, Brooke Lumer, Ghadeer Lamah, Dylan Cohen, Dennis Abate, Brian Perlstein, Ty Blitstein, Alexandria Henderson, Chloe McAloon and Cassandra Dalton. New Jersey Supreme Court Chief Justice Stuart Rabner and the Hon. Marilyn C. Clark, Presiding Judge, Criminal Division, Passaic County, presided over the final round. Students from Newton High School of Sussex County served as jurors. Newton High School placed third in the state championship. In the State Bar Foundation’s Fourth Annual Courtroom Artist Student Competition, Sarah Switlyk of North Hunterdon High School in Hunterdon County placed first. She will represent New Jersey in the courtroom artist division of the national competition. A total of 216 high school teams registered for the competition this season. This year’s case dealt with a roller coaster accident. Throughout the competition, students argue both sides of the case while playing the roles of lawyers, witnesses and jurors. The annual Vincent J. Apruzzese High School Mock Trial Competition is sponsored by the New Jersey State Bar Foundation, the educational and philanthropic arm of the New Jersey State Bar Association, in cooperation with the New Jersey State Bar Foundation and New Jersey’s county bar associations. For more information on the competition, visit the High School Mock Trial Competition page. For a list of all county mock trial champions, click here.